Jerry and Sherman go to the State theater to see the double-feature The Surfing Werewolf and The Eggplant That Ate Philadelphia. The boys are unaffected by the horror flicks they see at movies, but Lucy and Viv are scared silly. After seeing a scary movie, Lucy has a horrific nightmare in which she and Viv visit a haunted house and are changed into witches. 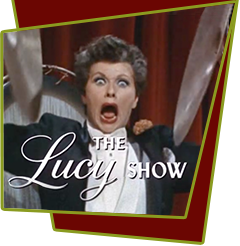 Special Notes: Lucy uses the name "Sassafrassa" in the dream sequence; this is actually the name she gave an imaginary friend when she was a child in Celeron, New York. Bloopers: Lucy and Viv are strapped to a table so Dracula can use the "electric dehumanizer" on them. As the screen fades to black for the commercial break, the head of a crew member prominently enters the camera shot. In the bedroom, as Viv reaches for the switch, Lucy yells for her not to turn off the lights. The light switch is already in the off position.